We have had three dogs during our thirty plus years of marriage. 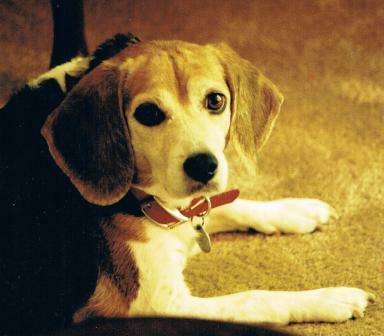 Our second dog was a beagle named Maggie (Maggie May or Sister Mary Margaret or Flange). 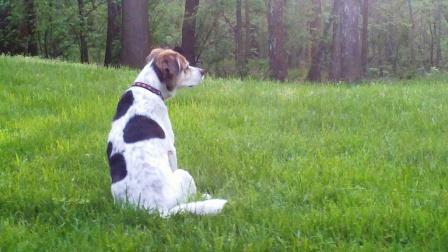 She was a wonderful spirit, and was hard headed as most beagles. She loved to howl at almost anything and took great pride in scaring off the mailman and all delivery trucks. At the age of four, she had a ruptured disc. During the early nineties, this was considered a death penalty for a dog. We took her to the veterinary school at NC State University. There she had one of the first back surgeries for dogs ever. Of course now it is common practice to do surgery on dogs with a ruptured disc. She did very well after the surgery and made a great companion for our daughters. However, when she reached the age of ten, she started to have a lot of pain and did not display any joy in life. Our vet suggested that we should put her down. I had just discovered the benefits of vitamin D at the time and so we started to supplement with vitamin D3. We also had gotten a mixed breed dog that we named Sophie (Sophie May, Sophia Maria, black and spotty pretty princess puppy, or Peggy Sue). It was a rebirth for Maggie as she played like she was a puppy again. She lived with great joy for another five good years after we started the supplementation. Her heart failed suddenly as she was flying across the yard to see my wife that just returned home. It was like one of the chambers of the heart just stopped functioning. We had to put her down, but she did enjoy five years because of the vitamins. Old age comes to everyone and eventually death, regardless of how healthy we live. Dogs, just like their human companions have learned to live inside without sunshine. This is a problem as we do not get enough vitamin D. We either have to supplement or determine a course of action that will allow us to get enough UVB rays. So how much vitamin D is enough for dogs. We treated Maggie just like she had a human physiology and gave her between 20 to 40 IU per pound of body weight per day (at twenty pounds this was 400 to 800 IU per day). She thrived at this level of supplementation. We also gave her sulfur supplements as chondroitin sulfate, and glucosamine sulfate. Toxicity has long been a problem with dogs with vitamin D and it has to do with manufacturing errors in making dog food. There was recently a case in Spain where there was too much vitamin D put in the dog food by Mercandona. The typical type of error is in the units for vitamin D. The toxicity level in which half of dogs will die or LD 50 is 88 mg/kg (40mg/lb) in a single dose. Clinical symptoms of vitamin D toxicity in dogs have been found as low as 3 mg/kg or 1.3 mg/lb. But you just said 40 IU per pound per day was the correct amount? Here is the error issue. Forty IU for vitamin D3 is equivalent to one microgram. Yes that’s right, micrograms and not milligrams. Let’s take Maggie as our example. She weighed approximately twenty pounds. We were giving her 400 to 800 IU per day. At 1.3 mg/lb would have been 40,000 IU/mg x 1.3mg/lb x 20 lbs = 1,040,000 IU. This toxic amount was enough vitamin D at the rate of 800 IU per day to last for 1,040,000/ 800 = 1300 days or three and half years. You can see how easy it is to get the units confused and also know that 800 IU per day is a significantly safe level. If you drink the amount of water in one day that you would normally consume in three years – well?! This entry was posted in Dogs by Mark Pegram. Bookmark the permalink. I very much appreciate this conversation. Thank you. You quoted LD50 for Vitamin D for dogs. Where were you able to find this information? I have been searching for this information for some time as have other colleagues with an interest in the topic. The rule of thumb that seemed to work for my dog was 40 IU per pound of body weight. That would be 400 IU for your ten pound dog. It really does not make any difference if the vitamin D3 is from CLO or from lanolin. Two problems here. One, you are converting iu to mcg wrong- 1iu is about equal to 2mcg. Two, you are comparing a safe dose to the weight of the dog. Everywhere else I have seen online the correct comparison is dose per pound of food consumed. Please verify your results before posting something such as this online. Had I not known to get multiple opinions and taken your advice, I would have my doses was off. 40 IU is equal to 1 microgram. 40,000 IU is equal to one milligram.